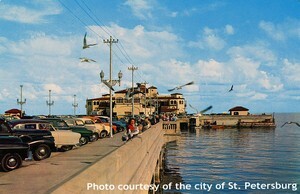 The St. Petersburg Pier has long been a popular attraction and landmark stretching out into Tampa Bay. With fishing 24 hours a day, shopping, and waterfront dining among the activities, both residents and visitors have enjoyed spending time here. 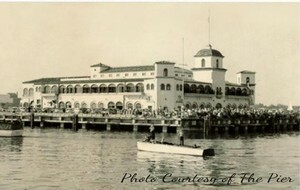 The Pier that stands today is an inverted pyramid with five floors. It is home to four waterfront restaurants, twelve specialty shops, an aquarium, fishing, bicycle rentals, pelicans, seagulls, and amazing views of Tampa Bay. Even though the pier has undergone many changes in the last 124 years, the landmark has remained an important part of the City of St. Petersburg and it's history. The 1973 inverted pyramid and the businesses located there will be open until May 31, 2013. Plans for the new Pier, "The Lens", are still controversial and being discussed. Demolition is planned for late 2013 with the new Pier opening in 2015. While the details of the new Pier seem currently uncertain, the good times and memories made on the 1973 inverted pyramid will not be soon forgotten. As forty years of history comes to an end, a new chapter is beginning for the St. Petersburg Pier. Updated June 1, 2013: The shops, businesses, and restaurants, including The Pier itself, closed on May 31, 2013. 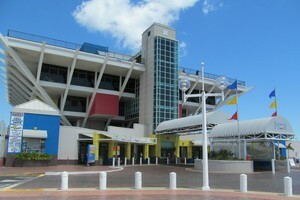 The Aquarium is relocating to St. John's Pass in Madeira Beach. Plans for the New Pier are still being discussed.